Factory shop manual errors The fork assembly's comprise of the fork stanchions, lower legs or bodies, the dampers, and springs. The factory shop manual pn 065146, I believe, is in error in it's description on how the commando forks function. Figure G2 and text section G2...especially in regards to the early commando (and atlas). The Covenant conversion is an interesting bit of craftsmanship. This is mainly due to the positioning of the bump stop holes on the early models below the taper apex. This kit is legitimately needed for these early versions. If the vent holes are below the taper apex, then the oil flow into the center of the damper body is unimpeded. In this condition the forks have NO bottom hydraulic bump stop. The conversion kit plugs these holes to restore oil flow past the apex restriction by relocating the holes above the taper apex like the later commando forks which do have some hydraulic bump stop. A few specifications to allow analysis. (I assume I have typical components......) The damper body taper apex is 1.010" in diameter. The vent holes (2) on the late commando are .250" diameter Analysis The 2 vent holes area summed is .098 in/sq. Some high school math shows that at full restriction (fork and damper meeting at taper apex) you have .0192358 in/sq. This represents the minimum area that fluid can pass through and thereby constituting hydraulic bump stop. If the math is done to find out the diameter of the taper where the aperture, between the taper and fork tube ID, is .098 in/sq, it can be determined that that happens at .959" diameter. It seems like poetic justice that it just happens to cooincide with the center of the 2 vent holes. The factory manual eludes on the drawing and in the text that as the fork extends that the large hole becomes blocked off by the upper bush to start the function of a hydraulic bump stop and finally the small hole becomes blocked by the upper bush and final hydraulic stop is complete. THIS IS AN ERROR. this is why The fork damper rod tops out in the damper, 0.6"before the fork is extended enough to start to block off the big hole in the fork tube. This topping out action is also 1.25" short of reaching the smaller bump stop hole. The damper topping out limits the fork to 1.55" less travel than the bushes would otherwise allow. The reasons the factory manufactured the forks this way may hopefully be made known to us all one day. A longer damper rod 'would' allow for more fork extension, an therefore more fork travel. 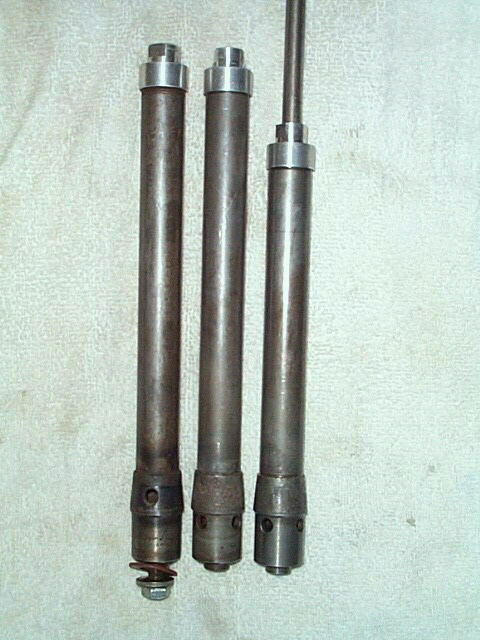 (left) a late model commando damper body with 2 vent hole above taper apex. (right) a shorter atlas damper body with 4 vent holes below the taper apex.